There are a flood of self help books on the market, for the most part it is almost like some one has written a piece of software that churns them out, same ideas, different buzz words, oh and the chapter order is scrambled! Most of these books have the credibility of an out of date milk carton. Often using outrageous titles like â€œ10 Days To A New Youâ€, or â€œThe 10 Secrets To Free Your Inner Selfâ€. My eyes roll into the back of my head and I want to crawl into a fetal position. The one thing that has always nagged at me is why you always seem to encounter these books in Airport book kiosks. Is this some subliminal message? Flying is mind numbingly boring, so why not read a book in the same vein while traveling. Yes Take-Charge Living does indeed contain many of the tried and tested formulas, but with a very unique addition, and one that I have not previously seen in print. What are others going to think about the new you? This a great question, and one that everyone contemplating a Self 2.0 should give serious consideration to. If you are currently viewed as a social Door Mat chances are that if you become more assertive you may well incur the ire of others. On the other hand if you are overbearing and climb down from the mountain, you may be perceived as having other motives. It is not an easy problem to resolve. Marion Jacobs suggests that you hold a steady course, you will not be able to please everyone, but what is your goal? To please your associates, friends, family, etc, or to please yourself? The other aspect that makes Take-Charge Living stand apart from the regular fare is that Dr. Jacobs recognizes that change take time, it is not something that can be achieved overnight, it is something that should be tackled in small easy to bite off pieces. I guess the immortal words â€œRome wasn’t built in a dayâ€ reflects the sentiment quite well. Change takes time, change will cause controversy, change may even lose you some friends, of course that begs the question, were they really friends to begin with? Marion Jacobs suggests that the key to change is not to launch into the deep end of the pool, but rather, spend time to evaluate what aspects of your life you are unhappy with. It could be some aspect of your job, or, a personal relationship, maybe even a family member, but you do want to change the circumstances. Spend some time evaluating what it is you want to change. Play scenarios in your head, practice what you wish to say, and contemplate the outcome. The author suggests that change is very much like a theatrical production, in fact she peppers the text with quotes and comments from George Bernard Shaw’s classic play Pygmalion, and its subsequent conversion to Broadway My Fair Lady. Using the analogy of life being a play, the author explains how in ‘six acts’ you can move gently from contemplation to completion. Take-Charge Living is available from Amazon. Marion Jacobs also has an informative web site that gives some further insight. 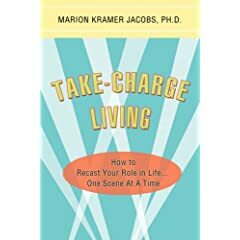 No user commented in " Book Review: Take-Charge Living by Marion Kramer Jacobs, PH.D "